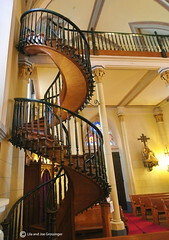 My aim was to visit the Loretto Chapel with its “miraculous” staircase. You can also view this image on Flickr.com. Located at 207 Old Santa Fe Trail, between Alameda and Water streets, I had no trouble finding my way using GPS . Entrance to the chapel requires a modest $3.00 fee. There are quite a few photo ops in the general area, since this is the old part of Santa Fe. I entered the chapel with my two Nikons, the D90 being equipped with the Tokina 11-16 mm lens , while I had the 18-200 Nikkor on my D5000 . You can do a great job of photographing the entire interior in less than 30 minutes, which I did. The reason for mounting the Tokina on the D90 is that the D5000 does not have a focusing motor like the D90 and the Tokina lens also lacks a focusing motor, so with the D5000 you would need to manually focus the Tokina. That explains in part why the D5000 is cheaper and smaller than the D90. Nikon lenses designated AF-S or AF-I have their own focus motors. I knew all that before I bought the Tokina, but I consider this lens to be so fine I would have bought it even if I did not have a D90. Manual focus is a breeze with this lens. For me, the D5000 was a compelling buy because of it’s swivel LCD and it’s ability to shoot with live preview. I can use this camera for waist level shooting and I don’t have to crawl around the floor like a worm to get eye-level with a toddler, small dog or cat. Yes, that is a SUPER feature. So to me the D90 and the D5000 make one fine camera. You can contact me at jgrossi1@elp.rr.com for any questions, tips or comments. I recently undertook an eight-day photo trek. I had some specific goals in mind and researched the trip extensively. Two gadgets were extremely helpful. I used GPS for my navigation for the entire trip. I located my lodging and some of the restaurants as well. I have heard and read a lot of horror stories concerning the use of GPS devices, but with a bit of common sense GPS is an excellent navigation tool. The other gadget I used for my trip was the IPOD . Never leave home without it. I have the RoadsideAmerica.Com app installed, as well as the Amazon Kindle app for reading. Downloading books from Kindle is a snap. I read wherever I go, the display on the IPOD makes reading in the dark pleasurable without disturbing your bed-mate. No lights needed. The one app I found most useful is the voice recorder. I took extensive notes whenever I stopped to take pictures. The keyboard is way too dinky and cumbersome for me, but the voice recorder worked like a charm. I wish Apple had the brains to include a built-in microphone. This is the only shortcoming I find with the IPOD. This is the permanent home of my photography blog. However, migration is going to take a few months as I add the old posts and then run both simultaneously until I feel I can let the other blog go. For a while I’m just going to change the looks of this place until I get to where I like it. My other blog is located here.